There's a redawn of the dead in Hollywood. The zombie movie genre is clawing its way back to life – with a vengeance. “Zombieland," a shoot-‘em-up horror comedy starring Woody Harrelson, is slated to hit theaters Oct. 2. “Colin,” an independent film reportedly made for $70 – with the help of a lot of living volunteers recruited through Facebook – made a bloody splash at Cannes in May. George Romero, who first turned the undead into art four decades ago, premiered his latest romp, “Survival of the Dead” at the 66th Venice Film Festival last week, marking first zombie movie to grace the event. 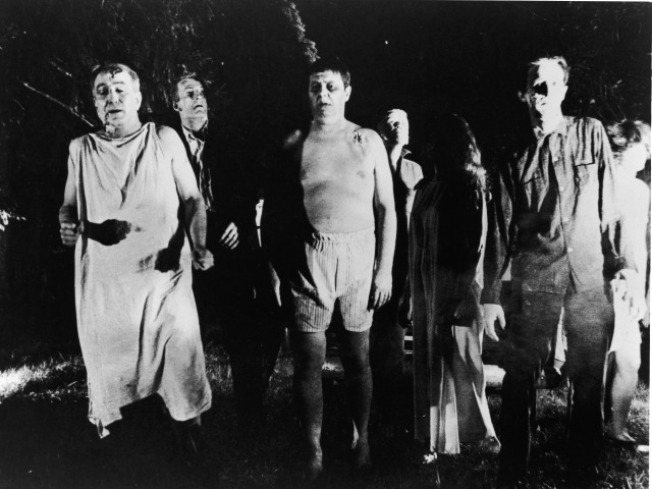 Now the worm-eaten granddaddy of them all – Romero’s 1968 "Night of the Living Dead" – is set to be remade as "Night of the Living Dead: Origins,” reimagined as a 3-D CGI-enhanced movie, according to The Hollywood Reporter. Romero, who has brought six zombie movies to life, won’t be involved. So why are we in the middle of a zombie revival? Romero's classic first outing was a movie for its times, a black-and-white parable about race and the state of the human race in an era of war and social upheaval. Influenced by Alfred Hitchcock, by then the grand old man of suspense, the film also scared the life out of many moviegoers. The new movies come amid war and a myriad of fears for the future. The flicks also reflect the filmmaking methods of our time – from the do-it-yourself opportunities afforded by handheld digital video cameras to the knock-your-limbs-off special effects wizardry provided by CGI technology. "Zombie films are always a vehicle to talk about something that happens in the present time," Romero told reporters in Venice last week. "I think if I were trying to make serious films about some of these topics I wouldn't be able to," he said. "So it's great to be able to bring the zombies and talk about social issues and have fun at the same time." So, apparently, we’ll always be hungry for more.